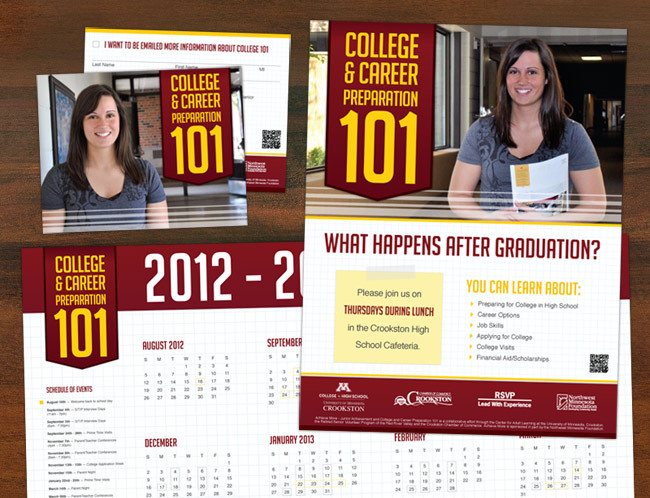 The University of Minnesota, Crookston teamed up with other local groups & organizations to start an educational program for high school students, that would educate them and get them ready for college. They needed some marketing materials for the program to inform students and their parents about upcoming events and the program itself. We created a style for these pieces that had a collegiate look and feel, with a bold color palette that fell in step with the university’s colors, and blocky, bold typography. We created a flyer, postcard, desktop calendar and stand-up tradeshow display, incorporating the style across all pieces.